This is a brand new line and stocks are still very limited! There may be a delay for some items, but we will keep you informed and updated as they become available. 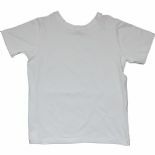 Perfect for school sports and P.E, this special wide-fit T-shirt makes getting dressed easy and comfortable! The innovative reversible design means that either side can be the front, so it's impossible to put on the wrong way round! Recommended for children who have difficulty putting clothes on, especially at school when mum or dad isn't around to help! Made with carefully sewn-down comfort seams and no label to irritate you! Ideal for autism, SPD and sensory kids. - Durable and sturdy - tested by parents! 97% Cotton & 3 % Spandex.